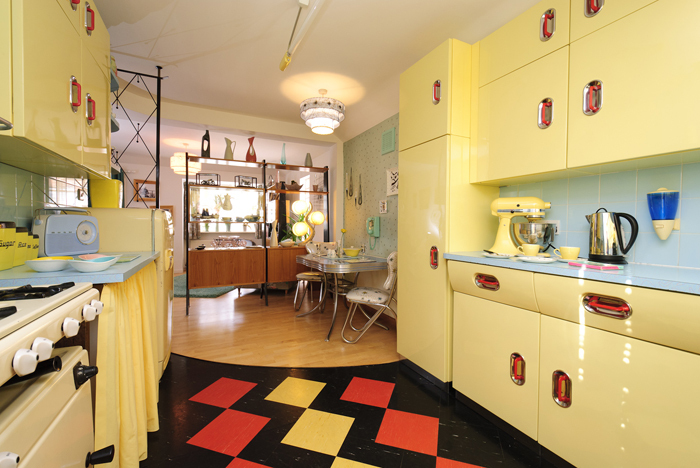 Planet Sputnik located our own British-built all-aluminium 1950s English Rose kitchen for £850 at a London antique dealer, back in pre-Internet 1997. Tracking down a complete suite merely by word of mouth had been quite a challenge, as so many of these units ­– by that time deemed virtually worthless ­– had been unceremoniously scrapped throughout the preceding decades. As a consequence, they’d become very hard to find. Oh, how times have changed. 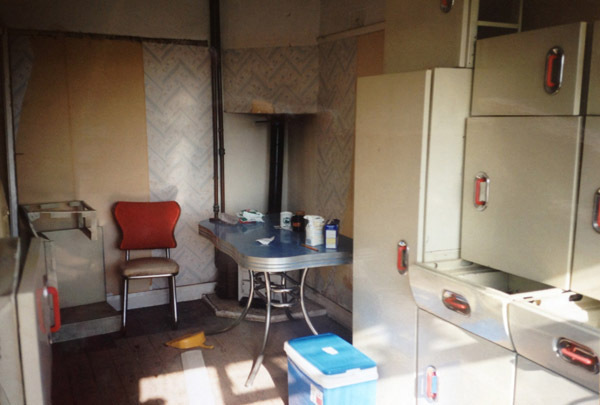 Today, the English Rose kitchen is considered a highly desirable vintage design classic and, thanks to the Internet, and particularly eBay and Salvoweb, locating one is rather easier – although returning it to its former glory will require some fairly full-on restoration. Don’t want to do the work yourself? Fully renovated and customised units can also be bought from the UK’s leading English Rose specialist, Source Antiques in Bath. However, such a high standard of finish costs: a four-cabinet sink unit will set you back nearly £2500. Source has also remanufactured some spares, which is handy if you’re restoring your own. 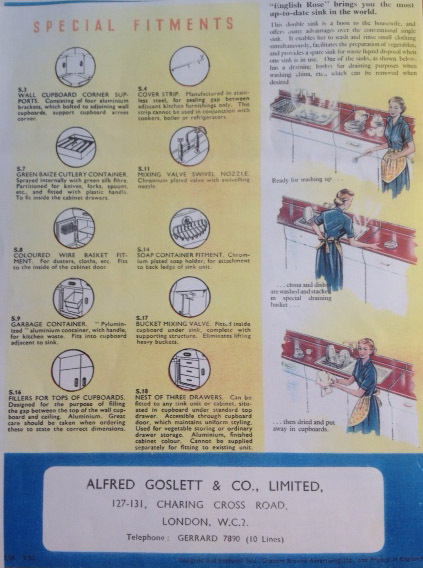 English Rose fitted kitchens were designed in the late 1940s by Warwick-based Constant Speed Airscrews (CSA) Industries, a company that had originally manufactured parts for aircraft during World War Two. 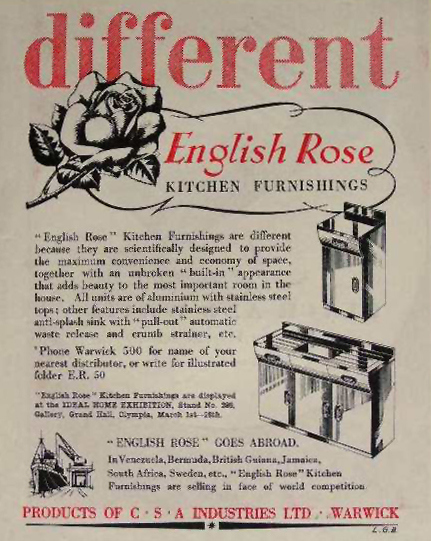 It seems the firm had come up with an ingenious way of utilising its engineering expertise, machinery and workforce when peacetime finally arrived, and the result – the beautifully designed, American-style English Rose – was one of the first, if not the first, modular kitchens available in Europe. 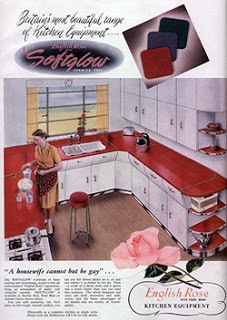 Imagine the tremendous impact the sleek aluminium floor and wall cabinets, Formica and stainless steel worktops, built-in stove, oven, fridge and even a pull-out hostess trolley would have had at a time when most kitchens in Britain, which was still struggling from the privations of WWII, were a mish-mash of ancient freestanding wooden cabinets and minimal appliances. 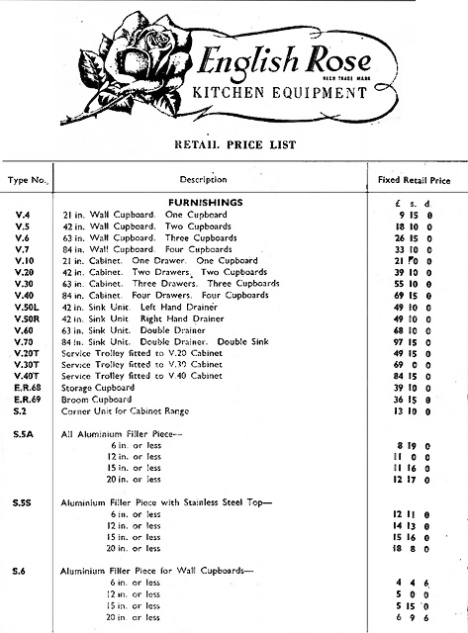 The fact that a luxury English Rose kitchen cost a small fortune only added to its prestige; check out this pricelist from a time when the average household income was around £8 per week. Thankfully we didn’t have to pay quite so much for our own English Rose cabinets, which the vendor told us had been pulled out of an old vicarage. Their condition wasn’t too bad when we acquired them, but we wanted to do the job properly. 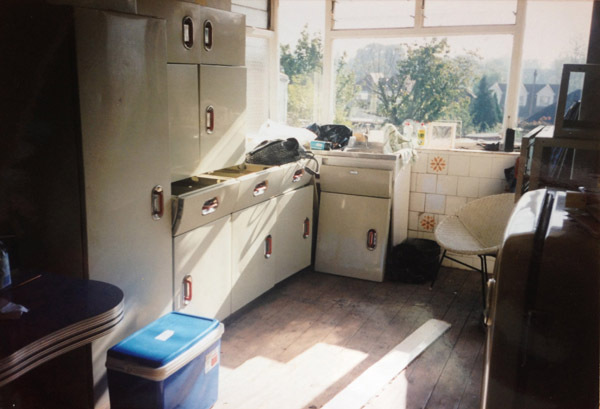 Our English Rose cabinets as purchased, stacked up in the kitchen that was to eventually become their home. Some of our fragile aluminium panels were a little dented, so they had to be straightened before being prepped for paint. 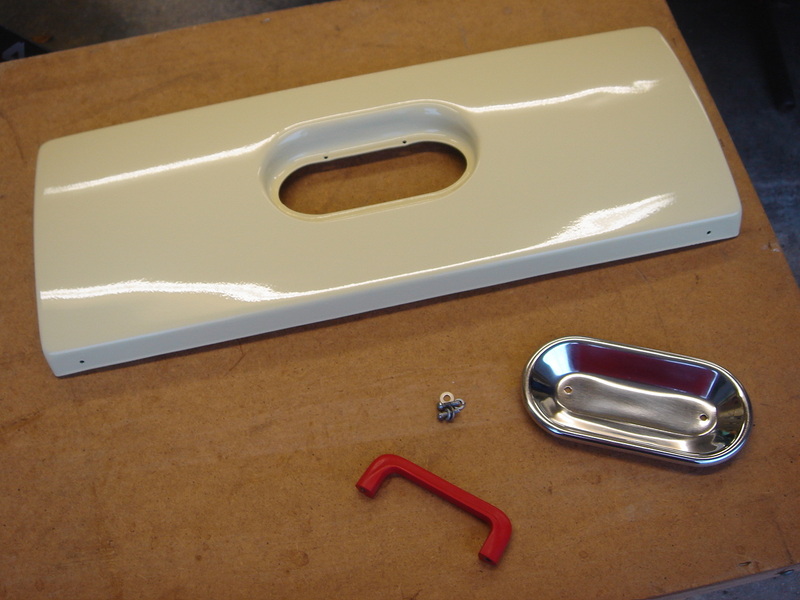 If you want to take the paint off completely, for instance if you are considering taking the cabinets back to bare aluminium and polishing them, a stripper such as Nitromors can be used with a scraper and then wire wool. It’s a long, laborious process, though – and make sure you wear protective gloves and eyeglasses. 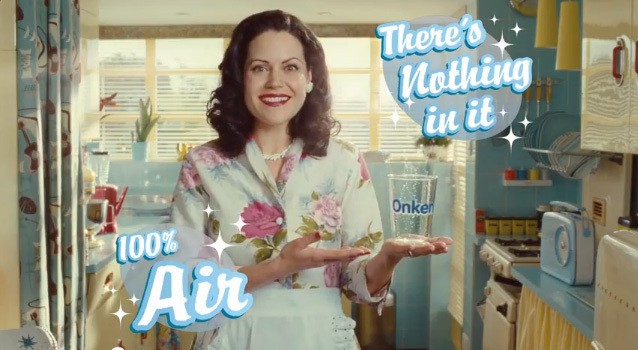 However, if you are planning to repaint, whatever the colour, you don’t really need to remove the old paint. 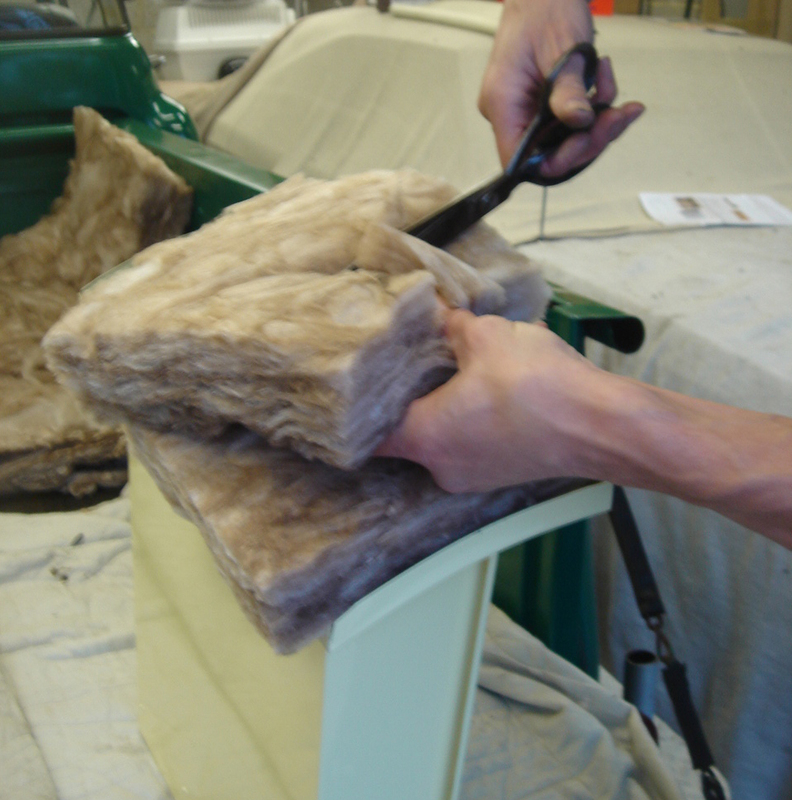 Simply flatten it off with ever-finer grades of wet and dry sanding paper, to provide a good key base for the new paint. We’d recommend you get the cabinets painted professionally for a better and longer-lasting finish, but by doing the prep work yourself you should save considerable money. We decided to respray ours in pale yellow, rather than the original cream. Crystal Finishes in Aldershot, Hampshire, carried out the work. Then everything had to be carefully screwed back together again before the kitchen was finally fitted. Thanks to worn hinges and catches, the doors took forever to hang and ‘gap’ correctly. Our English Rose looks great now, but a lot of time and effort went into getting it that way. 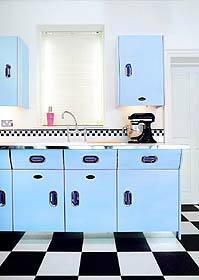 One easier alternative to repainting the cabinets is to have the doors and outer panels ‘wrapped’ in coloured film. This work can be carried out by those signwriting specialists who apply all-over advertising wraps to cabs and vans. It can give a great, uniform finish, although is best reserved for cabinets that aren’t in too bad a condition to start with, as it won’t disguise dents and deep scratches. When it comes to appliances, who would want to spoil such a beautiful period kitchen with unattractive, clunky, modern-day offerings? We wanted to complement our English Rose cabinets, not detract from their impact, so we went vintage as far as was practical and realistic. 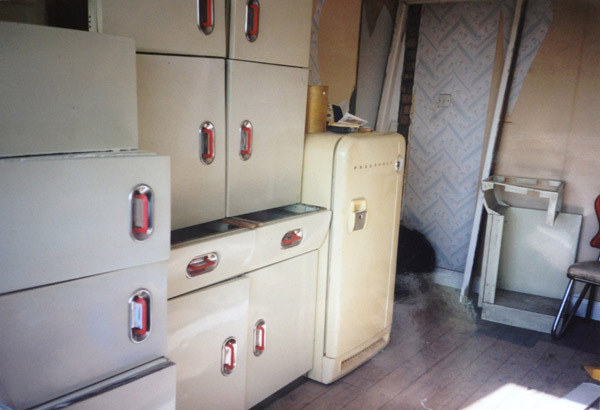 Our 1950s Prestcold fridge and New World gas stove came from house clearances. They are both British-built, work perfectly and are serviceable, although they are energy-inefficient in the extreme. 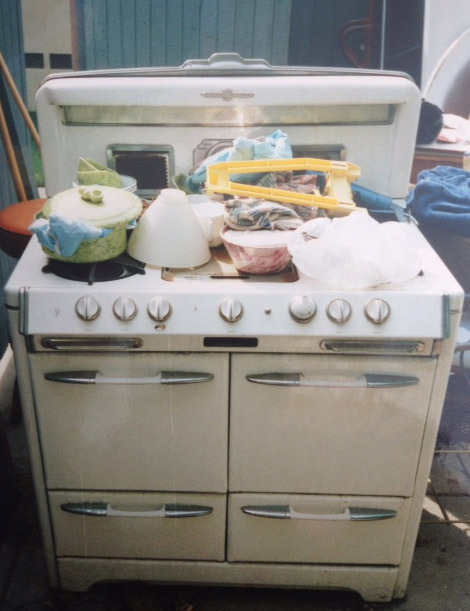 The New World has served us well for more than 15 years so far, but we are currently also restoring a huge 1950s O’Keefe and Merritt gas stove that we imported from vintage furniture specialist Xcape in Long Beach, California. The exterior panels have since been re-vitreous enamelled in powder blue by the sole British company we could find that was willing to take on the work: Trico Vitreous Enamel. The specialist, located in Bingley, West Yorkshire, has done a superb job, and with a wealth of antique stove restoration spares available in the States, we hope to finish the renovation some time soon. Regarding the washing machine and microwave, we had to make concessions to 21st century practicality and safety. 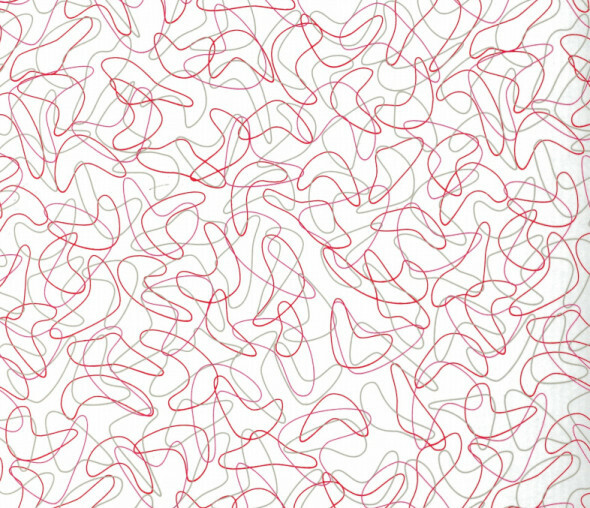 They’re ugly, but hidden well away. 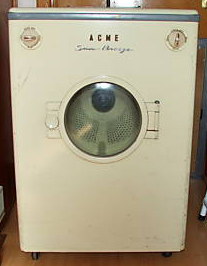 We were recently offered a yellow 1950s ACME Sun Breeze tumbledryer, which looked fabulous but may have been a step too far. We regretfully had to turn it down. 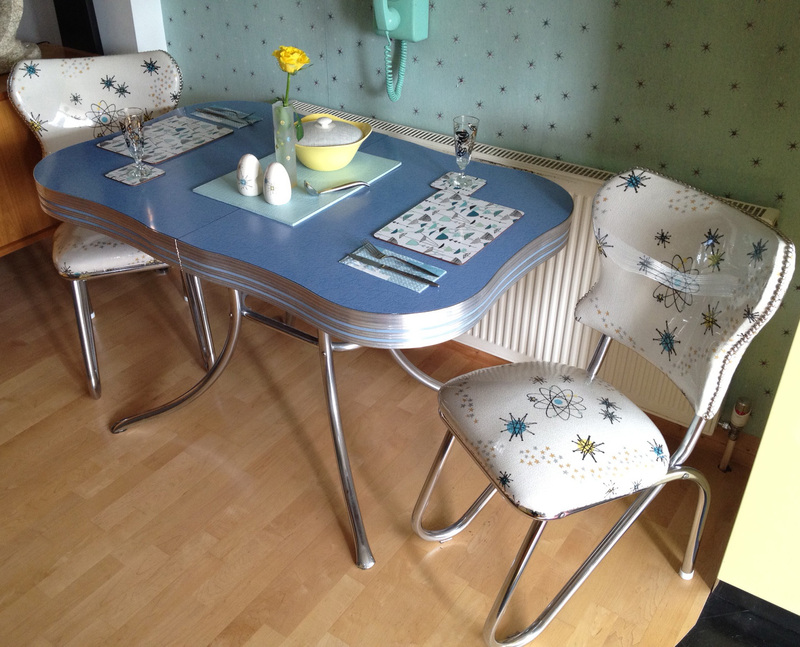 Our 1950s Formica and chrome table and chairs, or dinette, came from London dealer Out of Time, which specialises in mid-century American furniture. We had the four chairs reupholstered in reproduction atomic-print barkcloth from Californian company Melinamade, and protected them with wipe-clean clear vinyl. 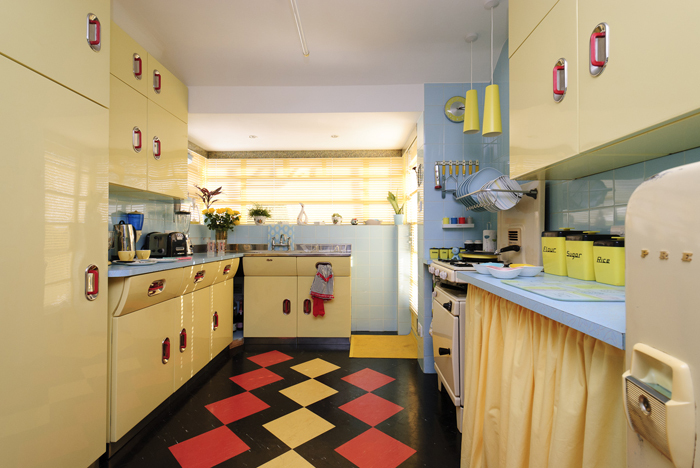 Melinamade printed the blue wallpaper, too, while Marley supplied the kitchen’s black, yellow and red vinyl floor tiles. 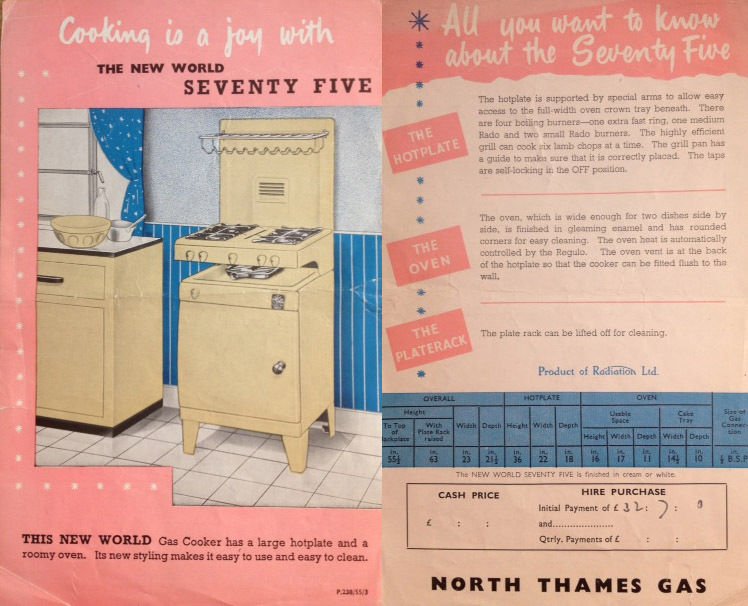 We have collected vintage kitchenalia such as canisters, cookware, utensils and crockery over many years, tracking it down to all corners of the earth from Britain, Europe, America and even Australia. The cantilevered striplight dates from the 1950s, and the blue fibreglass-sheet lampshade over the table is a reproduction from American company Moon Shine. 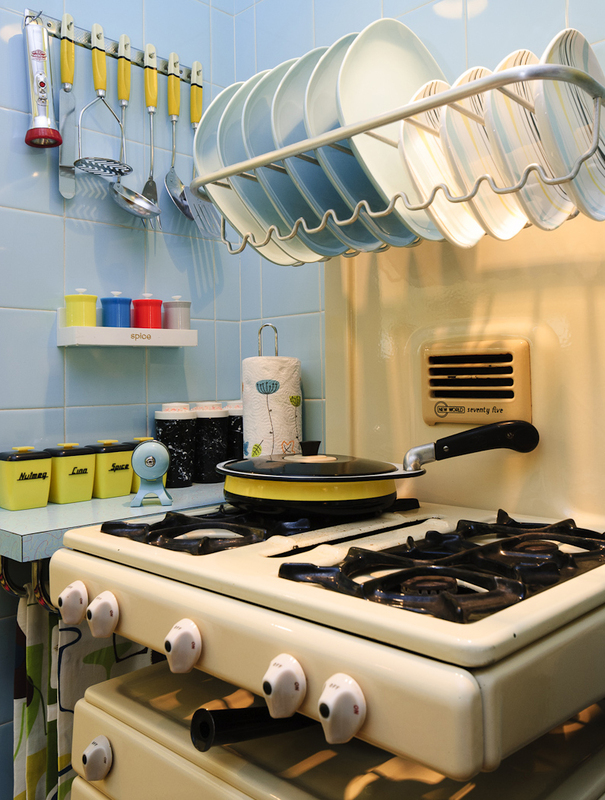 Good old IKEA was the source of the yellow metal lamps suspended over the stove. 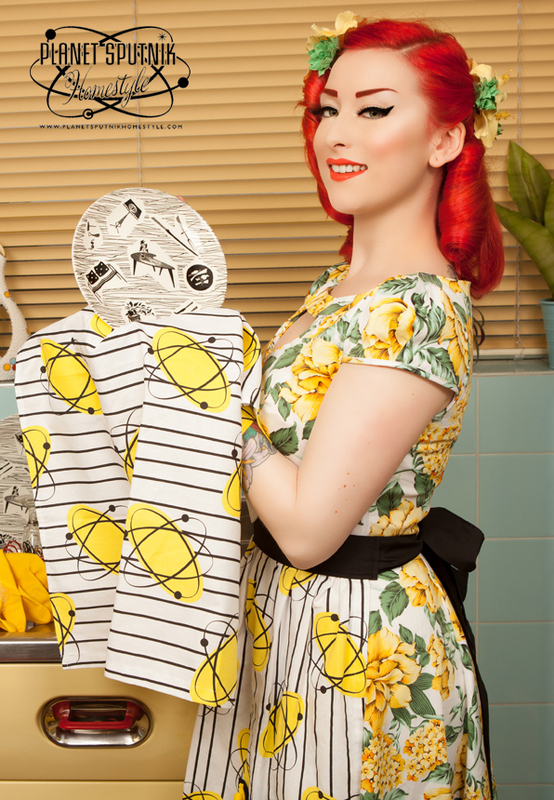 And now, to complement the English Rose kitchen’s fabulous vintage styling, Planet Sputnik has produced our very own range of premium, British-made retro textile homewares, under the Planet Sputnik Homestyle brand. Click on the ‘shop’ banner at the top of the page, or see www.planetsputnikhomestyle.com to see and buy. 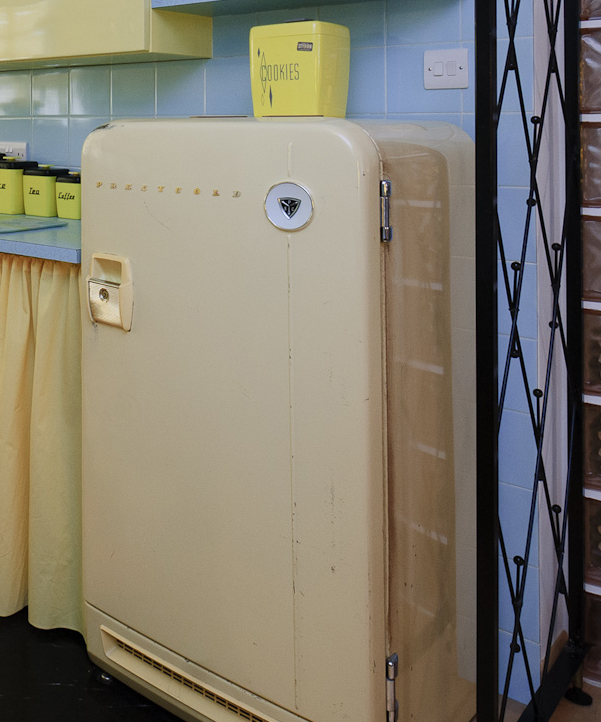 Our 1950s kitchen is proof that vintage living in the 21st century can be accessible and practical – you just have to put in a little hard work. All words © copyright Planet Sputnik 2015.